Houseplant or garden annual, the begonia is one of the showiest and easiest to grow of all flowering plants. Begonias are actually tropical plants and, therefore, love warm and humid growing conditions. They will do well in full sun or partial shade, but their tender nature prevents them from surviving through cold weather. Set them out as bedding plants in the spring after all danger of frost has past, and they will quickly establish themselves and provide a bountiful showing of almost continuous blossoms and full fleshy foliage until fall frost puts an end to their production. Or, before the cold weather hits your garden, you can dig up and pot some of those lush flowering begonia plants and bring them indoors to continue their show and brighten your home through the winter months. Just remember to provide adequate moisture and humidity and, ideally, some filtered window sunlight. 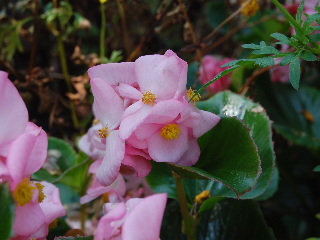 Begonia plants can be propagated from cuttings or they can be started from seeds if you prefer. Sow the seeds indoors at least a couple of months before the last anticipated spring frost in order to give the seedlings enough growing time to be ready for transplanting outdoors into your garden. The easiest way, however, to procure healthy young growing stock is to purchase the plants at the garden center. The most common type of begonia available at your local garden center is the semperflorens wax begonia, which is generally sold in “six-pack” containers of young annual seedlings (1 to 2 inches tall) ready to plant into your garden or containers in the spring and early summer. 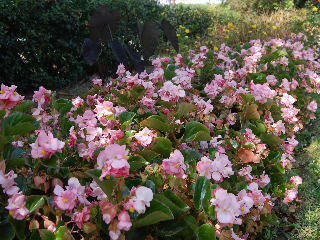 The flowers of begonias are red, pink, white, and sometimes yellow or coral. The dense waxy foliage, either green or bronze in color, is just as attractive as the blossoms. Plant your begonias, in generous quantities, into your outdoor garden as borders, masses, or clumps in different sections of your garden. Mix the colors together, or create patterns or stripes of various colors for contrast. As the growing season continues, the plants will become more dense and lush, creating a solid canvas of colors. Begonia plants also work great in window boxes and in hanging baskets mixed in with other plants of differing colors, textures, heights, and forms. Although the semperflorens wax begonias (fibrous-rooted) are the varieties most commonly planted, the tuberous-rooted (bulb-like) varieties are good choices for the more shaded areas of your garden. The tuberous begonias are originally from South America and Central America, and love a shady moist site that is rich in organic matter. Begonias are extremely easy to maintain throughout the growing season. Feed them a balanced plant food every month or so, and watch for and remove dead leaves and wilting or dead blossoms. Even though begonias are not cold hardy and are somewhat tender in nature, they are quite resistant to pests and diseases. Give them a rich soil, plenty of moisture and humidity, and stand back and watch them grow!